Fats, Oils and Grease (FOG) - aren't just bad for your arteries and heart, they're bad for sewers as well. Sanitary sewer overflows are increasingly caused by grease that clogs and blocks sewer pipes. These are items that we frequently use when we cook such as cooking oil, butter or leftover grease from cooking bacon or other meats. After cooking, wait for the “FOG” to cool down. Then, scrape the leftover cooking fats into the trash or other container, such as an old metal coffee can or food scrap recycling bin. 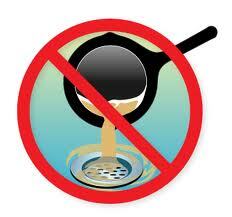 Never wash or put fats, oils or grease down the drain even if you use hot water. These items will build up over time and block sewer lines. Blocked sewer lines can cause raw sewage to backup into your home, and could lead to costly repair bills. Raw sewage could also backup onto neighborhood streets and into storm drains, which drain to rivers and the ocean. Overflows can pose health and environmental hazards, in addition to being costly to repair.